Electro Optic Systems (EOS) has finalised a $170 million contract to supply remote weapon systems products to the US. As reported earlier this year on Defence Connect, US company Orbital ATK and EOS reached an agreement, and have now have signed a contract, relating to EOS' new R-400S-Mk2 weapon system product that is deliverable from 2017 to 2020. The new weapon system was released to the market earlier this year. Prior to the launch of the system on the market, EOS developed a variant of the system to extract optimum performance from weapons produced by Orbital ATK for US, NATO, Commonwealth and other forces. EOS advised on 11 May 2017 that contract execution was delayed in order to determine whether production could be expanded to meet additional demands. Orbital ATK then increased its temporary purchase order with EOS to US$14 million to ensure that the initial contract moved forward while the companies jointly assessed new orders. The temporary purchase orders issued by Orbital ATK to initiate this program now lapse in favour of the main contract. The NSW-based company said it has now secured access to sufficient resources and supplies to expand its order intake for 2017 well beyond this initial $170 million contract. 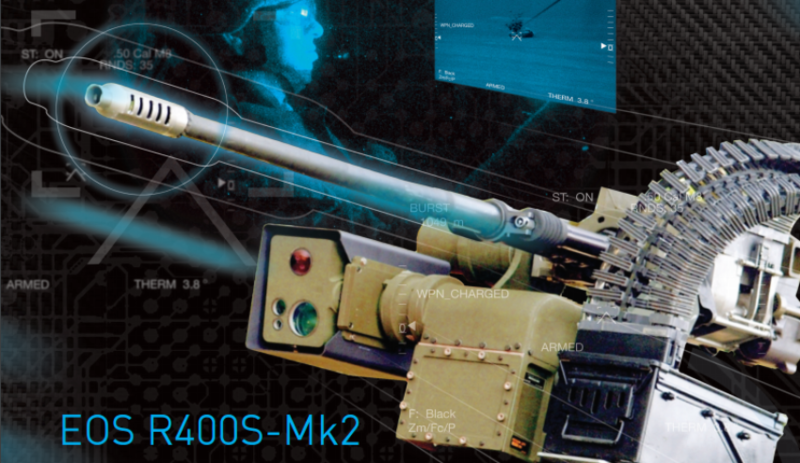 EOS now expects to exceed $500 million in 2017 orders for its new R-400S-Mk2 weapon system. The EOS R400S-Mk2 is a stabilised, single weapon station with flexible ballistic protection. EOS said the small dispersed control modules allow integration into tight internal vehicle spaces. It also features an integrated video tracker, an integrated battlefield sector scan, integrated firing inhibit zones and various sensors, including a laser rangefinder and day and thermal cameras.